Tooth loss can seriously affect the form and function of your smile, making important tasks like eating, speaking, and smiling extremely difficult. Dr. James Slaman uses the latest technology to place and restore dental implants, the most stable tooth replacement solution available. What are the advantages of implant dentistry over conventional restorative techniques? Although the crowns, bridge, or denture will need to be replaced at some point, implants themselves can last a lifetime. Dental implants are the only treatment that can stop bone atrophy, one of the natural consequences of tooth loss, and keep the bone healthy and strong. Because missing teeth can make you feel self-conscious about your appearance, dental implants and custom restorations can boost your self-image. If you are missing a single tooth due to trauma or infection, an implant-supported crown can complete your smile. Large gaps left behind by one, two, or three missing teeth can be restored with implant-retained dental bridges. If you are missing one or both dental arches, Dr. Slaman can provide implant-supported dentures using All-on-4®. When you lose a permanent tooth, your jawbone almost immediately begins to recede. By acting like natural tooth roots, dental implants can keep your jawbone intact and prevent bone recession. If you have already experienced some level of bone loss, Dr. Slaman can perform bone grafting or a sinus lift to give your implants a healthy, stable foundation. These biocompatible titanium posts will replace your tooth roots to support a permanent, custom-crafted restoration such as a dental crown, bridge, or denture. 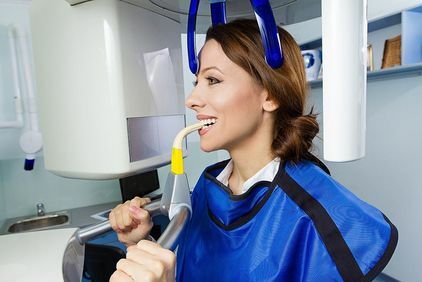 Dr. James Slaman will use the latest technology to plan your dental implants treatment to ensure a comfortable restoration and a natural-looking smile. He also offers a full range of implant options, including traditional, All-on-4®, and immediate load implants. Dr. Slaman will use our advanced GALILEOS ComfortPLUS cone beam imaging to capture 3-D images of your jaw. Implants will be permanently set in your jawbone. As the bone tissue heals around the metal posts, they will become a fixed part of your oral structure. Because of this process, it is essential that candidates for dental implants have enough bone tissue to support the posts. Fortunately, if your jaw has started to recede because of tooth loss, a bone graft can often restore your candidacy. Dr. Slaman will use our advanced GALILEOS ComfortPLUS cone beam imaging to capture 3-D images of your jaw. Then he can look for signs of bone recession. If you require a bone graft, he may refer you to a specialist for treatment, or he may perform your procedure here in the office. The 3-D images will also enable him to create a unique treatment plan. Dental Implants are the gold standard in teeth replacement, providing unrivaled support and aesthetics. Dr. James Slaman describes the basics of dental implants, which he is able to place at his Albuquerque, NM, office. When developing your treatment plan, Dr. Slaman will choose the right type of implants for your needs. Traditional implants may be appropriate if you are going to receive an implant-supported crown and you do not have significant bone loss. If you are going to receive implant-supported dentures, you may benefit from All-on-4® implants. These smaller posts will go in at a slight angle. In this way, they can create a strong base for your denture with reduced impact to your jaw. In many cases, we can also provide immediate placement implants, attaching your restoration on the same day as your surgery. In these cases, Dr. Slaman will collaborate with an oral surgeon or periodontist. Note that we do not offer mini implants. Dr. Slaman believes that traditional implants are much more secure and will provide more durable treatment results. Dr. Slaman typically performs dental implant surgery on an outpatient basis using oral conscious sedation. Though you will technically be awake, you will be very relaxed and unaware of what is going on during your treatment. After the medications take effect, Dr. Slaman will make incisions in your gums and precisely place the implants in your jaw according to his surgical plan. It will usually take about 4 to 6 months for your bone to fuse around the posts. During this time, Dr. Slaman will send impressions of your gums to our partner lab. Then technicians will create a restoration that fits comfortably and matches the contours of your mouth. We will also provide a provisional restoration. Not only will it fill in the gap in your smile, but it will also train and reshape the surrounding gum tissue so that your final restoration will fit more securely. This is accomplished using a customized impression technique to transfer the information to the dental lab so a technician can replicate the proper tissue. After the implants are securely integrated with your jaw, you will return for a second minor surgery to uncover the implants from your gums. There will be a second, shorter healing period for your gums to close around the implants. Then Dr. Slaman can attach your permanent restoration and complete your treatment. Why Choose Dr. Slaman for Your Implants Treatment? Dr. Slaman is committed to continuing education, including classes in dental implants. Four times a year, he meets with the Rio Grande Implants Study Club for hands-on training. Thanks to this experience, he can provide you with effective care and the latest implant techniques. Dr. Slaman also has an eye for aesthetics. He will make sure that your restoration has a beautiful, lifelike appearance, particularly if it will be visible when you smile. After supplying your temporary restoration, he will contour your gum line for greater definition and a more realistic effect. Dental implants offer a wide variety of cosmetic and functional advantages, including increased bite strength, improved appearance, and superior durability. The benefits of dental implants are unmatched when compared to traditional teeth replacement options, as they restore health, function, and aesthetics to your smile. Preservation of Jawbone: Dental implants act as prosthetic tooth roots, stimulating the nerves in the jawbone. This encourages new bone growth and prevents bone recession. Alternatively, traditional tooth replacement options such as dental crowns or bridges do not support jawbone structure. For this reason, patients who have been missing teeth for a long time have a “sunken-in” or concave appearance. Dental implants eliminate this effect. Protection of Existing Teeth: Before the invention of dental implants, a single tooth was replaced with a dental bridge. In order for a traditional bridge to be placed, your adjacent teeth must be reduced and reshaped in preparation for the restoration. This negatively affects your natural tooth structure and compromises your oral health. Dental implants offer a single-tooth solution for a single-tooth problem, keeping your healthy teeth intact. Prevention of Further Oral Health Issues: Missing teeth affect the force of your bite, which can result in more serious problems such as gum recession, temporomandibular joint (TMJ) issues, or further tooth loss. 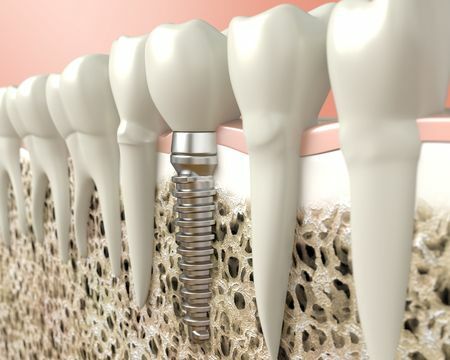 Dental implants fuse with your jawbone during a process called osseointegration. This happens during the healing period, when the jawbone fuses to the titanium post. Osseointegration results in optimal stability, and makes normal dental function possible. Once your new implant is restored, you can chew, eat, and speak just as you could with a natural tooth. Certain restorations, such as dentures or bridges, can require cumbersome hygiene routines. Dentures must be removed and soaked throughout the night. Dental bridges require special instruments or floss threaders for proper maintenance. Alternatively, restored dental implants are permanent, and can be brushed and flossed just like your natural teeth. Dental implants offer a wide variety of cosmetic and functional advantages, including increased bite strength, improved appearance, and superior durability. Over the decades, dental implants have taken the place of bridges as the most dependable treatment for missing teeth. In fact, dental implants are widely praised as the most successful teeth replacement solution available on the market today. When properly cared for through routine checkups, cleanings, and home care, dental implants can last a lifetime. A Complete Smile: Dental implants effectively fill in any gaps in your smile, improving your appearance in addition to restoring function. Increased Confidence: Many people who are missing teeth feel embarrassed or self-conscious. Dental implants can give you a much-needed boost in confidence so you can take on the world. Natural-Looking Appearance: Your restorations will be custom-made and color-matched to blend in with your smile. The high-quality materials are incredibly lifelike and indistinguishable from your own natural teeth. Enriched Quality of Life: With dental implants, you will not only look and feel your best, you will be able to enjoy life again without worry.